The Rev. Mark Jabalé OSB, Emeritus Bishop of Menevia, will celebrate a Pontifical High Mass in St Mary Moorfields Church, Eldon St, London, on Thursday September 14th, starting at 7pm. 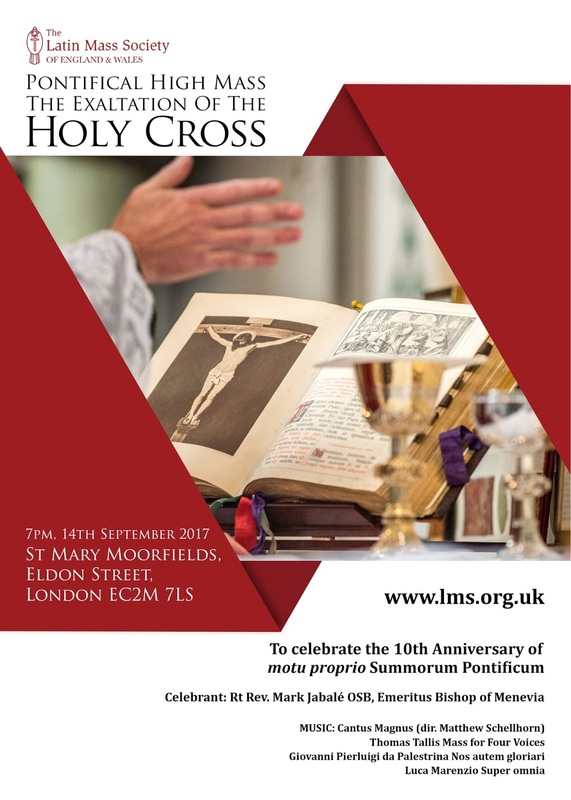 This day is the feast of the Exaltation of the Holy Cross, and the 10th anniversary of the motu proprio Summorum Pontificum coming into effect. Music will be proved by Cantus Magnus, directed by Matthew Schellhorn, and will include Thomas Tallis’ Mass for Four Voices, Nos autem gloriari oportet by Giovanni Pierluigi da Palestrina, and Super omnia by Luca Marenzio.